Based on several years of vintage Ampeg B15 designs, the Trip Top uniquely combines the original circuits of both the Ampeg B-15NC (1964) as well as the later B-15NF (1965-67). The B-15-NF channel has the volume control section before the tone stack and in the B-15-NC channel it is after. Maintaining these circuits keeps the same gain structure and biasing found in the original B-15N amp designs, helping to preserve their true heritage. It also has two power supply settings – Cathode and Fixed bias to provide further tone structure. This might be the best sounding amp I've ever played through. But calling it a bass amp is missing half the point. It’s an AMAZING guitar amp. It has a different sonority than other Trinity offerings which have a focus on a very smooth but sparkly top end. The Trip Top is the opposite – there’s still a nice smooth top end -and plenty of it – but this amp is all about low end girth and grind. It’s got a nice big tight booty (even with the bass tone knob on full!) that inspires rocking out down low on the neck with open chords!! Fixed bias has a more forward, clear, present sound… Cathode bias gives it a saggier feel but adds this gorgeous rich high harmonic overtone to everything – really nice for those ringy single coil U2-esque type sounds. The Trip Top is designed to output approximately 30 watts in cathode bias mode and 40 watts in fixed bias mode using 6L6 power tubes. These two modes are switch selectable. It has two channels each have Volume with a ‘Pull Bright’ switch, Treble and Bass controls. The first channel, NORMAL, from the B-15-NF, has the volume control section before the tone stack. The second channel, CASCADE, comes from the B-15-NC which has the volume control section after the tone controls. There is a third input that LINKS the two channels for additional grit and drive. 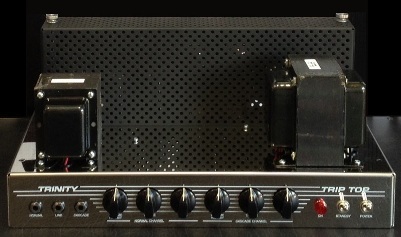 The power amp section has two switch selectable bias modes – fixed (B-15NF) and cathode (B-15NC). Solid state rectifier diodes were used for the “NB” configuration, but not incorporated into our design (easy mod). The Output Transformer has multiple impedance secondaries which allow a choice of 4, 8 or 16 ohm speaker loads. The primary output impedance is 6800 ohms. Weight: Head: 30 lbs., 115 Combo 80 lbs.